Thank you for your interest in volunteering as a debate judge! We want you to know that as a judge, you are an extremely important part of our program. Getting help from judges like you is what makes this debate league possible. In case you are new to debate judging, or if you just want to read up on what judging in our tournament entails, we’ve assembled some basic information below to help prepare you for the tournament. The “affirmative” team is arguing in favor of the resolution. The “negative” team is arguing against the resolution. Each team is trying to win the debate. Debates have a particular order in which the debaters take turns speaking. This is referred to as the debate format. Each speaking turn is allotted a set amount of time, for instance 4 minutes for an opening statement and 3 minutes for a closing statement. The speaking times and the order of speeches in this league is described in the Luddy Debate League Debate Guide. A typical tournament proceeds as follows. In the morning, there will be student and judge check-in. That is followed by an educational seminar on the debate topic for the day, delivered either by someone from the Coolidge Foundation or by an outside guest. That seminar is intended to give students and judges the opportunity to learn a little more about the topic that will be debated that day, and allow students to ask clarifying questions. After the morning seminar, the first round match-ups will be posted, which will describe which teams are debating each other, in which location, and with which judge. After each round, the ballots will be collected, the results will be tallied, and then the next round of match-ups will be generated and posted. 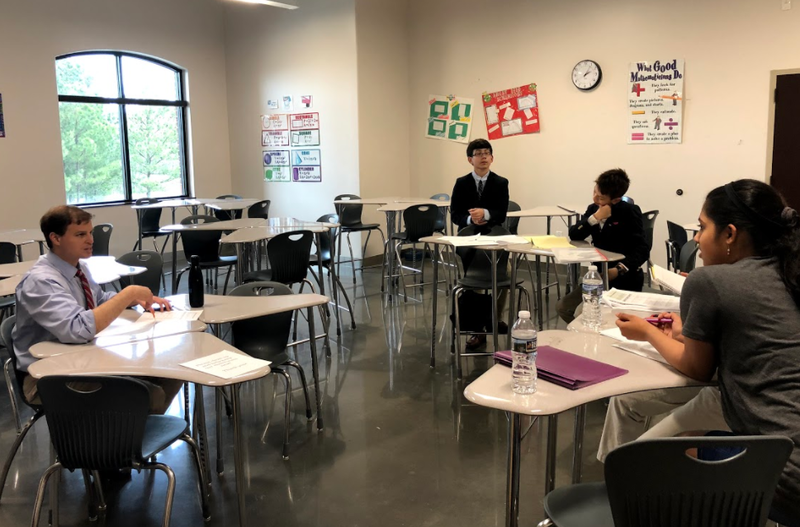 A typical Luddy Debate League tournament will go three to four rounds, after which the winners will be determined based on their record and speaker points. There is always at least a short break in between rounds. These offer a good opportunity to stretch, visit the judge’s lounge for some refreshment, and get your next room/time assignment. As a debate judge, your main role and responsibility is to listen to each side make its case and then do three things: 1) render a decision about which team won the debate, 2) award individual speaker points, and 3) return your ballot promptly (or allow it to be collected by a staffer or volunteer). Which speaker did the best job of putting forth good arguments for his or her position? Which speaker did the best job of answering his or her opponent’s arguments? Did either speaker fail to address an important argument by his or her opponent? Which speaker provided better evidence and research to support his or her contentions? Did the speakers speak at a reasonable and understandable pace? Which speaker was more logical? Did the speaker stay on topic? At the Coolidge Foundation, we believe in the power of citizen judges to be able to follow a debate and render a reasonable decision. Taking notes while listening is appropriate and encouraged. You won’t be able to write everything down, but you should be able to make a few notes on each side’s key arguments and identify whether the other side did an adequate job to address them. The most important things when judging a debate are to adopt a neutral stance about the resolution, and to do your best to be fair, encouraging, and supportive to your debaters. They are here to learn from you, no matter what your experience level is. Does the speaker present in a fluent and compelling manner? Does the speaker use all available speech time and cross examination time? Does the speaker properly reference opposing arguments and cite allusions to evidence? Does the speaker address the opponent in an appropriate style (i.e., not demeaning)? Does the speaker stay on topic? Remember, as a citizen judge, you get the final word in determining who won. Thank you again for your interest. As mentioned, without volunteers like you, we could not have these debate tournaments. We hope that you will come and judge with us. If you are available and interested, please Register to Judge for the Luddy Debate League. If you still have any questions about judging in a Luddy Debate League tournament, contact Coolidge Foundation Debate Director Jared Rhoads (jrhoads@coolidgefoundation.org).